Hibiscus is one of the most sought after flowering plants. 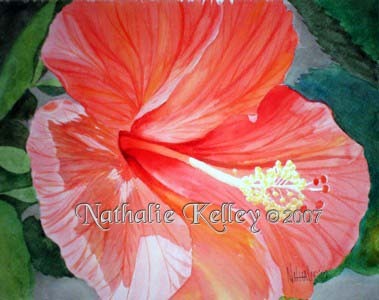 The Hibiscus flower is both huge and delicate, as if they were made out of airy crepe paper. The first time I saw a Hibiscus was at my work place. There was a flower bed with a Hibiscus that had beautiful deep rose colored blooms that were the size of dinner plates. I now have several in my own flower beds. I am intrigued by the almost alien looking stamen and I love the way light filters through the petals. They are happy and so much fun to paint.